Source: Holder, E. (1892). At the Dry Tortugas During the War. San Francisco, CA: Californian Illustrated Magazine. 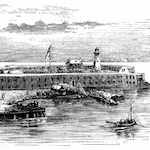 The following is an account written by Emily Holder describing her memories of Fort Jefferson. They tell the poignant and often fascinating story of the hardships, isolation and drama of daily life at the Dry Tortugas in the nineteenth century. Holder, Emily. At the Dry Tortugas During the War. Lit2Go Edition. 1892. Web. <https://etc.usf.edu/lit2go/57/at-the-dry-tortugas-during-the-war/>. April 25, 2019. Emily Holder, At the Dry Tortugas During the War, Li2Go edition, (1892), accessed April 25, 2019, https://etc.usf.edu/lit2go/57/at-the-dry-tortugas-during-the-war/.